We are trying to get fives years' worth of living out of our five months here. Nick had another weekend off of work, so we took off again. 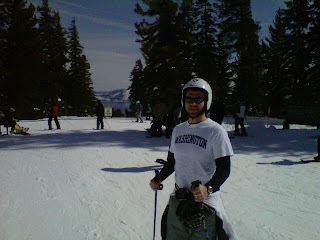 One of his classmates has a cabin in Tahoe, so about 30 of the class went skiing. Not wanting to crash the house with a family, we booked a room in Reno (half an hour away) and headed out. Nick spent Saturday skiing Northstar. He hasn't skied much in his life, but says he really started to get the hang of it by the end of a long day. 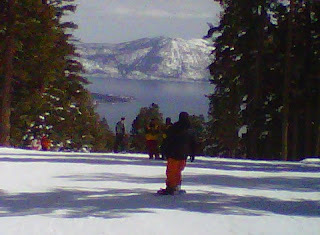 Check out the view from the top of the slopes! I took the kids to beautiful Tahoe City for Snowfest. What an awesome snow fort! The kids kept wanting to go back to it throughout the day and see if it had been opened up for kids to climb on. They had two objectives for the day: build a snowman and sled. As we worked on the snowman, Channel 13 Sacramento showed up to film the cuteness. Of course they did; we're newsworthy! Strange as it may seem, I think our snowman looks right out of the tropics. I was pretty proud of Rigby, climbing to the top of this hill, sled in tow. I have noticed recently how much older he acts than many kids his age. I think this is due to being best friends with his big sister. If you asked, they would tell you how much fun they had sledding. They have forgotten that all three of them were crying by the end. After sledding, we watched a parade! This may have been a very low-budget parade compared to our experience with Chinese New Year, but part of that low budget included candy and mardi gras beads that were tossed to the spectators, so my kids were thrilled. The adults around us all collected for my kids, too, so they did pretty well in the sugar and necklace counts. After the parade, a local art shop hosted a wooden bear painting activity for kids. Rigby really was this focused on his project the whole time. I love his bear! It looks like the earth. We went back to our hotel for naps and dinner. We stayed at Circus Circus, so I took the kids to the midway for what looks a great deal like "fun." Let me just mention here that I can't stand Chuck E. Cheese. They peddle their money-wasting wares to little kids who will get nothing in return for their investment. Of course there is nothing wrong with dropping some money to play a little game and hope for a cheap stuffed pig, but Chuck E. Cheese feels like a casino to me. I think that if you really wanted to raise a kid to gamble in casinos, that is where you would start your training. So it makes sense that Circus Circus would train up the next generation of return-guests. And yes, I took my kids to it, but only because I wanted them to have a "vacation" out of this little trip. And no, I don't really feel that good about it. Nick says this post is getting controversial, but this is how I feel. Gotta throw in Curie "in" her travel crib when we got back home. Also, Nick and his male relations have a thing about not shaving on vacation. Nick initiated his classmates into the family by talking them all into letting the facial hair go. His dad requested the pics, so this one's for you, Pabby. And this one. Kyle, I included his T-shirt in this shot for you. PS. We (I read them to Dad) love reading about all of your adventures. There are so many cute things about this post... but oh my goodness how adorable is Curie in her winter clothes and hat!?? I would totally get my news crew up there to take pictures of your kids if I were in charge of channel 13... soooo adorable!! !